For the 13th dynasty princess, see Hatshepsut (king's daughter). Hatshepsut came to the throne of Egypt in 1478 BC. Her rise to power was noteworthy as it required her to utilize her bloodline, education, and an understanding of religion. Her bloodline was impeccable as she was the daughter, sister, and wife of a king. Her understanding of religion allowed her to establish herself as the God’s Wife of Amen. Officially, she ruled jointly with Thutmose III, who had ascended to the throne the previous year as a child of about two years old. Hatshepsut was the chief wife of Thutmose II, Thutmose III’s father. She is generally regarded by Egyptologists as one of the most successful pharaohs, reigning longer than any other woman of an indigenous Egyptian dynasty. According to Egyptologist James Henry Breasted, she is also known as "the first great woman in history of whom we are informed." Hatshepsut was the daughter and only child of Thutmose I and his primary wife, Ahmose. Her husband Thutmose II was the son of Thutmose I and a secondary wife named Mutnofret, who carried the title King's daughter and was probably a child of Ahmose I. Hatshepsut and Thutmose II had a daughter named Neferure. After having their daughter, Hatshepsut could not bear any more children. Thutmose II with Iset, a secondary wife, would father Thutmose III, who would succeed Hatshepsut as pharaoh. Although contemporary records of her reign are documented in diverse ancient sources, Hatshepsut was thought by early modern scholars as only having served as a co-regent from about 1479 to 1458 BC, during years seven to twenty-one of the reign previously identified as that of Thutmose III. Today Egyptologists generally agree that Hatshepsut assumed the position of pharaoh. Hatshepsut was described as having a reign of about 21 years by ancient authors. Josephus and Julius Africanus both quote Manetho's king list, mentioning a woman called Amessis or Amensis who has been identified (from the context) as Hatshepsut. In Josephus' work, her reign is described as lasting 21 years and nine months, while Africanus stated it was twenty-two years. At this point in the histories, records of the reign of Hatshepsut end, since the first major foreign campaign of Thutmose III was dated to his 22nd year, which also would have been Hatshepsut's 22nd year as pharaoh. Dating the beginning of her reign is more difficult, however. Her father's reign began in either 1526 or 1506 BC according to the high and low estimates of her reign, respectively. The length of the reigns of Thutmose I and Thutmose II, however, cannot be determined with absolute certainty. With short reigns, Hatshepsut would have ascended the throne 14 years after the coronation of Thutmose I, her father. Longer reigns would put her ascension 25 years after Thutmose I's coronation. Thus, Hatshepsut could have assumed power as early as 1512 BC, or, as late as 1479 BC. The earliest attestation of Hatshepsut as pharaoh occurs in the tomb of Ramose and Hatnofer, where a collection of grave goods contained a single pottery jar or amphora from the tomb's chamber—which was stamped with the date Year 7. Another jar from the same tomb—which was discovered in situ by a 1935–36 Metropolitan Museum of Art expedition on a hillside near Thebes—was stamped with the seal of the "God's Wife Hatshepsut" while two jars bore the seal of The Good Goddess Maatkare. The dating of the amphorae, "sealed into the [tomb's] burial chamber by the debris from Senenmut's own tomb," is undisputed, which means that Hatshepsut was acknowledged as king, and not queen, of Egypt by Year 7 of her reign. Hatshepsut re-established the trade networks that had been disrupted during the Hyksos occupation of Egypt during the Second Intermediate Period, thereby building the wealth of the Eighteenth Dynasty. She oversaw the preparations and funding for a mission to the Land of Punt. This trading expedition to Punt was roughly during the ninth year of Hatshepsut's reign. It set out in her name with five ships, each measuring 70 feet (21 m) long, bearing several sails[dubious – discuss] and accommodating 210 men that included sailors and 30 rowers. Many trade goods were bought in Punt, notably frankincense and myrrh. Hatshepsut's delegation returned from Punt bearing 31 live myrrh trees, the roots of which were carefully kept in baskets for the duration of the voyage. This was the first recorded attempt to transplant foreign trees. It is reported that Hatshepsut had these trees planted in the courts of her mortuary temple complex. Egyptians also returned with a number of other gifts from Punt, among which was frankincense. Hatshepsut would grind the charred frankincense into kohl eyeliner. This is the first recorded use of the resin. Hatshepsut had the expedition commemorated in relief at Deir el-Bahari, which is also famous for its realistic depiction of the Queen of the Land of Punt, Queen Ati. The Puntite Queen is portrayed as relatively tall and her physique was generously proportioned, with large breasts and rolls of fat on her body. Due to the fat deposits on her buttocks, it has sometimes been argued that she may have had steatopygia. However, according to the pathologist Marc Armand Ruffer, the main characteristic of a steatopygous woman is a disproportion in size between the buttocks and thighs, which was not the case with Ati. She instead appears to have been generally obese, a condition that was exaggerated by excessive lordosis or curvature of the lower spine. Hatshepsut also sent raiding expeditions to Byblos and the Sinai Peninsula shortly after the Punt expedition. Very little is known about these expeditions. Although many Egyptologists have claimed that her foreign policy was mainly peaceful, it is possible that she led military campaigns against Nubia and Canaan. Hatshepsut was one of the most prolific builders in ancient Egypt, commissioning hundreds of construction projects throughout both Upper Egypt and Lower Egypt. Arguably, her buildings were grander and more numerous than those of any of her Middle Kingdom predecessors'. Later pharaohs attempted to claim some of her projects as theirs. She employed the great architect Ineni, who also had worked for her father, her husband, and for the royal steward Senemut. During her reign, so much statuary was produced that almost every major museum with Ancient Egyptian artifacts in the world has Hatshepsut statuary among their collections; for instance, the Hatshepsut Room in New York City's Metropolitan Museum of Art is dedicated solely to some of these pieces. Following the tradition of most pharaohs, Hatshepsut had monuments constructed at the Temple of Karnak. She also restored the original Precinct of Mut, the ancient great goddess of Egypt, at Karnak that had been ravaged by the foreign rulers during the Hyksos occupation. It later was ravaged by other pharaohs, who took one part after another to use in their own pet projects. The precinct awaits restoration. She had twin obelisks, at the time the tallest in the world, erected at the entrance to the temple. One still stands, as the tallest surviving ancient obelisk on Earth; the other has broken in two and toppled. The official in charge of those obelisks was the high steward Amenhotep. Another project, Karnak's Red Chapel, or Chapelle Rouge, was intended as a barque shrine and originally may have stood between her two obelisks. It was lined with carved stones that depicted significant events in Hatshepsut's life. 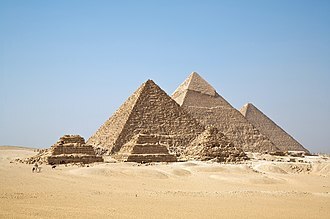 She later ordered the construction of two more obelisks to celebrate her 16th year as pharaoh; one of the obelisks broke during construction and a third was therefore constructed to replace it. The broken obelisk was left at its quarrying site in Aswan, where it still remains. Known as the Unfinished Obelisk, it provides evidence of how obelisks were quarried. The Temple of Pakhet was built by Hatshepsut at Beni Hasan in the Minya Governorate south of Al Minya. The name, Pakhet, was a synthesis that occurred by combining Bast and Sekhmet, who were similar lioness war goddesses, in an area that bordered the north and south division of their cults. The cavernous underground temple, cut into the rock cliffs on the eastern side of the Nile, was admired and called the Speos Artemidos by the Greeks during their occupation of Egypt, known as the Ptolemaic Dynasty. They saw the goddess as akin to their hunter goddess, Artemis. The temple is thought to have been built alongside much more ancient ones that have not survived. This temple has an architrave with a long dedicatory text bearing Hatshepsut's famous denunciation of the Hyksos that has been translated by James P. Allen. The Hyksos occupied Egypt and cast it into a cultural decline that persisted until a revival brought about by her policies and innovations. This temple was altered later and some of its inside decorations were usurped by Seti I of the Nineteenth Dynasty, in an attempt to have his name replace that of Hatshepsut. Following the tradition of many pharaohs, the masterpiece of Hatshepsut's building projects was a mortuary temple. She built hers in a complex at Deir el-Bahri. It was designed and implemented by Senenmut at a site on the West Bank of the Nile River near the entrance to what now is called the Valley of the Kings because of all the pharaohs who later chose to associate their complexes with the grandeur of hers. Her buildings were the first grand ones planned for that location. The focal point of the complex was the Djeser-Djeseru or "the Sublime of Sublimes", a colonnaded structure of perfect harmony built nearly one thousand years before the Parthenon. Djeser-Djeseru sits atop a series of terraces that once were graced with lush gardens. Djeser-Djeseru is built into a cliff face that rises sharply above it. Djeser-Djeseru and the other buildings of Hatshepsut's Deir el-Bahri complex are considered to be significant advances in architecture. Another one of her great accomplishments is the Hatshepsut needle (also known as the granite obelisks). Although it was uncommon for Egypt to be ruled by a woman, the situation was not unprecedented. As a regent, Hatshepsut was preceded by Merneith of the First Dynasty, who was buried with the full honors of a pharaoh and may have ruled in her own right. Nimaathap of the Third Dynasty may have been the dowager of Khasekhemwy, but certainly acted as regent for her son, Djoser, and may have reigned as pharaoh in her own right. Nitocris may have been the last pharaoh of the Sixth Dynasty. Her name is found in the Histories of Herodotus and writings of Manetho, but her historicity is uncertain. Queen Sobekneferu of the Twelfth Dynasty is known to have assumed formal power as ruler of "Upper and Lower Egypt" three centuries earlier than Hatshepsut. Ahhotep I, lauded as a warrior queen, may have been a regent between the reigns of two of her sons, Kamose and Ahmose I, at the end of the Seventeenth Dynasty and the beginning of Hatshepsut's own Eighteenth Dynasty. Amenhotep I, also preceding Hatshepsut in the Eighteenth Dynasty, probably came to power while a young child and his mother, Ahmose-Nefertari, is thought to have been a regent for him. Other women whose possible reigns as pharaohs are under study include Akhenaten's possible female co-regent/successor (usually identified as either Nefertiti or Meritaten) and Twosret. Among the later, non-indigenous Egyptian dynasties, the most notable example of another woman who became pharaoh was Cleopatra VII, the last pharaoh of Ancient Egypt. Perhaps in an effort to ease anxiety over the prospect of a female pharaoh, Hatshepsut claimed a divine right to rule based on the authority of the god Amun. In comparison with other female pharaohs, Hatshepsut's reign was much longer and more prosperous. She was successful in warfare early in her reign, but generally is considered to be a pharaoh who inaugurated a long peaceful era. She re-established international trading relationships lost during foreign occupation by the Hyksos and brought great wealth to Egypt. That wealth enabled Hatshepsut to initiate building projects that raised the calibre of Ancient Egyptian architecture to a standard, comparable to classical architecture, that would not be rivaled by any other culture for a thousand years. She managed to rule for about 20 years. 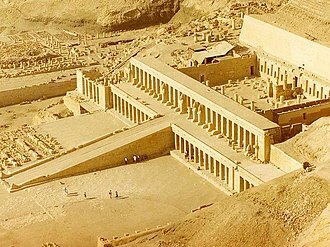 One of the most famous things that she did was build Hatshepsut's temple (see above). Hyperbole is common to virtually all royal inscriptions of Egyptian history. While all ancient leaders used it to laud their achievements, Hatshepsut has been called the most accomplished pharaoh at promoting her accomplishments. This may have resulted from the extensive building executed during her time as pharaoh, in comparison with many others. It afforded her many opportunities to laud herself, but it also reflected the wealth that her policies and administration brought to Egypt, enabling her to finance such projects. Aggrandizement of their achievements was traditional when pharaohs built temples and their tombs. Women had a relatively high status in ancient Egypt and enjoyed the legal right to own, inherit, or will property. A woman becoming pharaoh was rare, however; only Sobekneferu, Khentkaus I and possibly Nitocris preceded her. The existence of this last ruler is disputed and is probably a mis-translation of a male king. Nefernferuaten and Twosret may have been the only women to succeed her among the indigenous rulers. In Egyptian history, there was no word for a "queen regnant" as in contemporary history, "king" being the ancient Egyptian title regardless of gender, and by the time of her reign, pharaoh had become the name for the ruler. Hatshepsut is not unique, however, in taking the title of king. Sobekneferu, ruling six dynasties prior to Hatshepsut, also did so when she ruled Egypt. Hatshepsut had been well trained in her duties as the daughter of the pharaoh. During her father's reign she held the powerful office of God's Wife. She had taken a strong role as queen to her husband and was well experienced in the administration of her kingdom by the time she became pharaoh. There is no indication of challenges to her leadership and, until her death, her co-regent remained in a secondary role, quite amicably heading her powerful army—which would have given him the power necessary to overthrow a usurper of his rightful place, if that had been the case. At her mortuary temple, in Osirian statues that regaled the transportation of the pharaoh to the world of the dead, the symbols of the pharaoh as the deity Osiris were the reason for the attire and they were much more important to be displayed traditionally, her breasts are obscured behind her crossed arms holding the royal staffs of the two kingdoms she ruled. This became a pointed concern among writers who sought reasons for the generic style of the shrouded statues and led to misinterpretations. Understanding of the religious symbolism was required to interpret the statues correctly. Interpretations by these early scholars varied and often, were baseless conjectures of their own contemporary values. The possible reasons for her breasts not being emphasized in the most formal statues were debated among some early Egyptologists, who failed to understand the ritual religious symbolism, to take into account the fact that many women and goddesses portrayed in ancient Egyptian art often lack delineation of breasts, and that the physical aspect of the gender of pharaohs was never stressed in the art. With few exceptions, subjects were idealized. Modern scholars, however, have theorized that by assuming the typical symbols of pharaonic power, Hatshepsut was asserting her claim to be the sovereign rather than a "King's Great Wife" or queen consort. The gender of pharaohs was never stressed in official depictions; even the men were depicted with the highly stylized false beard associated with their position in the society. Moreover, the Osirian statues of Hatshepsut—as with other pharaohs—depict the dead pharaoh as Osiris, with the body and regalia of that deity. All of the statues of Hatshepsut at her tomb follow that tradition. The promise of resurrection after death was a tenet of the cult of Osiris. Since many statues of Hatshepsut depicted in this fashion have been put on display in museums and those images have been widely published, viewers who lack an understanding of the religious significance of these depictions have been misled. Aside from the face depicting Hatshepsut, these statues closely resemble those of other kings as Osiris, following religious traditions. One of the most famous examples of the legends about Hatshepsut is a myth about her birth. In this myth, Amun goes to Ahmose in the form of Thutmose I and awakens her with pleasant odors. At this point Amun places the ankh, a symbol of life, to Ahmose's nose, and Hatshepsut is conceived by Ahmose. Khnum, the god who forms the bodies of human children, is then instructed to create a body and ka, or corporal presence/life force, for Hatshepsut. Heket, the goddess of life and fertility, and Khnum then lead Ahmose along to a lioness' bed where she gives birth to Hatshepsut. Reliefs depicting each step in these events are at Karnak and in her mortuary temple. Welcome my sweet daughter, my favorite, the King of Upper and Lower Egypt, Maatkare, Hatshepsut. Thou art the Pharaoh, taking possession of the Two Lands. Then his majesty said to them: "This daughter of mine, Khnumetamun Hatshepsut—may she live!—I have appointed as my successor upon my throne... she shall direct the people in every sphere of the palace; it is she indeed who shall lead you. Obey her words, unite yourselves at her command." The royal nobles, the dignitaries, and the leaders of the people heard this proclamation of the promotion of his daughter, the King of Upper and Lower Egypt, Maatkare—may she live eternally. For a general notion of Hatshepsut's appearance at a certain stage of her career, we are indebted to one of those wall inscriptions. It states that "to look upon her was more beautiful than anything; her splendor and her form were divine." Some have thought it odd that the female Pharaoh should have been so bold, fiftyish as she was. Not at all. She was merely saying how things were about thirty-five years back, before she had married Thutmose II and slugged it out with Thutmose III. "She was a maiden, beautiful and blooming", the hieroglyphics run, and we have no reason to doubt it. Surely there is no harm in telling the world how one looked in 1515 B.C. Hatshepsut died as she was approaching what we would consider middle age given typical contemporary lifespans, in her twenty-second regnal year. The precise date of Hatshepsut's death—and the time when Thutmose III became the next pharaoh of Egypt—is considered to be Year 22, II Peret day 10 of her reign, as recorded on a single stela erected at Armant or January 16, 1458 BC. This information validates the basic reliability of Manetho's kinglist records since Hatshepsut's known accession date was I Shemu day 4 (i.e. : Hatshepsut died nine months into her 22nd year as king, as Manetho writes in his Epitome for a reign of 21 years and nine months). No contemporary mention of the cause of her death has survived. In June 2007, there was a discovery made in the Valley of the Kings. A mummy was discovered in the tomb of Hatshepsut's royal nurse, Setre-In. A tooth fragment found in a jar of organs was used to help identify the body to be Hatshepsut's. If the recent identification of her mummy is correct, however, the medical evidence would indicate that she suffered from diabetes and died from bone cancer which had spread throughout her body while she was in her fifties. It also would suggest that she had arthritis and bad teeth. Hatshepsut had begun construction of a tomb when she was the Great Royal Wife of Thutmose II, but the scale of this was not suitable for a pharaoh, so when she ascended the throne, preparation for another burial started. For this, KV20, originally quarried for her father, Thutmose I, and probably the first royal tomb in the Valley of the Kings, was extended with a new burial chamber. Hatshepsut also refurbished the burial of her father and prepared for a double interment of both Thutmose I and her within KV20. It is likely, therefore, that when she died (no later than the twenty-second year of her reign), she was interred in this tomb along with her father. During the reign of Thutmose III, however, a new tomb, (KV38), together with new burial equipment was provided for Thutmose I, who then was removed from his original tomb and re-interred elsewhere. At the same time Hatshepsut's mummy might have been moved into the tomb of her nurse, Sitre In, in KV60. It is possible that Amenhotep II, son to Thutmose III by a secondary wife, was the one motivating these actions in an attempt to assure his own uncertain right to succession. Besides what was recovered from KV20 during Howard Carter's clearance of the tomb in 1903, other funerary furniture belonging to Hatshepsut has been found elsewhere, including a lioness "throne" (bedstead is a better description), a senet game board with carved lioness-headed, red-jasper game pieces bearing her pharaonic title, a signet ring, and a partial shabti figurine bearing her name. In the Royal Mummy Cache at DB320, a wooden canopic box with an ivory knob was found that was inscribed with the name of Hatshepsut and contained a mummified liver or spleen as well as a molar tooth. There was a royal lady of the twenty-first dynasty of the same name, however, and for a while it was thought possible that it could have belonged to her instead. In 1903, Howard Carter had discovered a tomb (KV60) in the Valley of the Kings that contained two female mummies, one identified as Hatshepsut's wetnurse, and the other unidentified. In the spring of 2007, the unidentified body was finally removed from the tomb by Dr. Zahi Hawass and brought to Cairo's Egyptian Museum for testing. This mummy was missing a tooth, and the space in the jaw perfectly matched Hatshepsut's existing molar, found in the DB320 "canopic box". Her death has since been attributed to a carcinogenic skin lotion found in possession of the Pharaoh, which led to her having bone cancer. "There is a lot that speaks for this hypothesis," according to Helmut Wiedenfeld of the University of Bonn's pharmaceutical institute. 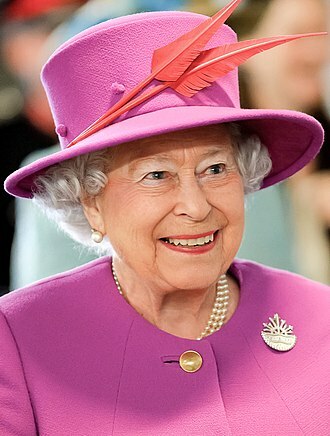 "If you imagine that the queen had a chronic skin disease and that she found short-term improvement from the salve, she may have exposed herself to a great risk over the years." Toward the end of the reign of Thutmose III and into the reign of his son, an attempt was made to remove Hatshepsut from certain historical and pharaonic records — a "damnatio memoriae". This elimination was carried out in the most literal way possible. Her cartouches and images were chiseled off some stone walls, leaving very obvious Hatshepsut-shaped gaps in the artwork. At the Deir el-Bahari temple, Hatshepsut's numerous statues were torn down and in many cases, smashed or disfigured before being buried in a pit. At Karnak, there even was an attempt to wall up her obelisks. While it is clear that much of this rewriting of Hatshepsut's history occurred only during the close of Thutmose III's reign, it is not clear why it happened, other than the typical pattern of self-promotion that existed among the pharaohs and their administrators, or perhaps saving money by not building new monuments for the burial of Thutmose III and instead, using the grand structures built by Hatshepsut. Amenhotep II, the son of Thutmose III, who became a co-regent toward the end of his father's reign, is suspected by some as being the defacer during the end of the reign of a very old pharaoh. He would have had a motive because his position in the royal lineage was not so strong as to assure his elevation to pharaoh. He is documented, further, as having usurped many of Hatshepsut's accomplishments during his own reign. His reign is marked with attempts to break the royal lineage as well, not recording the names of his queens and eliminating the powerful titles and official roles of royal women, such as God's Wife of Amun. Here and there, in the dark recesses of a shrine or tomb where no plebeian eye could see, the queen's cartouche and figure were left intact ... which never vulgar eye would again behold, still conveyed for the king the warmth and awe of a divine presence. Joyce Tyldesley hypothesized that it is possible that Thutmose III, lacking any sinister motivation, may have decided toward the end of his life to relegate Hatshepsut to her expected place as the regent—which was the traditional role of powerful women in Egypt's court as the example of Queen Ahhotep attests—rather than king. Tyldesley fashions her concept as, that by eliminating the more obvious traces of Hatshepsut's monuments as pharaoh and reducing her status to that of his co-regent, Thutmose III could claim that the royal succession ran directly from Thutmose II to Thutmose III without any interference from his aunt. The deliberate erasures or mutilations of the numerous public celebrations of her accomplishments, but not the rarely seen ones, would be all that was necessary to obscure Hatshepsut's accomplishments. Moreover, by the latter half of Thutmose III's reign, the more prominent high officials who had served Hatshepsut would have died, thereby eliminating the powerful religious and bureaucratic resistance to a change in direction in a highly stratified culture. Hatshepsut's highest official and closest supporter, Senenmut, seems either to have retired abruptly or died around Years 16 and 20 of Hatshepsut's reign, and was never interred in either of his carefully prepared tombs. According to Tyldesley, the enigma of Senenmut's sudden disappearance "teased Egyptologists for decades" given "the lack of solid archaeological or textual evidence" and permitted "the vivid imagination of Senenmut-scholars to run wild" resulting in a variety of strongly held solutions "some of which would do credit to any fictional murder/mystery plot." In such a scenario, newer court officials, appointed by Thutmose III, also would have had an interest in promoting the many achievements of their master in order to assure the continued success of their own families. Presuming that it was Thutmose III (rather than his co-regent son), Tyldesley also put forth a hypothesis about Thutmose suggesting that his erasures and defacement of Hatshepsut's monuments could have been a cold, but rational attempt on his part to extinguish the memory of an "unconventional female king whose reign might possibly be interpreted by future generations as a grave offence against Ma'at, and whose unorthodox coregency" could "cast serious doubt upon the legitimacy of his own right to rule. Hatshepsut's crime need not be anything more than the fact that she was a woman." Tyldesley conjectured that Thutmose III may have considered the possibility that the example of a successful female king in Egyptian history could demonstrate that a woman was as capable at governing Egypt as a traditional male king, which could persuade "future generations of potentially strong female kings" to not "remain content with their traditional lot as wife, sister and eventual mother of a king" and assume the crown. Dismissing relatively recent history known to Thutmose III of another woman who was king, Sobekneferu of Egypt's Middle Kingdom, she conjectured further that he might have thought that while she had enjoyed a short, approximately four-year reign, she ruled "at the very end of a fading [12th dynasty] Dynasty, and from the very start of her reign the odds had been stacked against her. She was, therefore, acceptable to conservative Egyptians as a patriotic 'Warrior Queen' who had failed" to rejuvenate Egypt's fortunes. In contrast, Hatshepsut's glorious reign was a completely different case: she demonstrated that women were as capable as men of ruling the two lands since she successfully presided over a prosperous Egypt for more than two decades. If Thutmose III's intent was to forestall the possibility of a woman assuming the throne, as proposed by Tyldesley, it was a failure since Twosret and Neferneferuaten (possibly), a female co-regent or successor of Akhenaten, assumed the throne for short reigns as pharaoh later in the New Kingdom. The "Hatshepsut Problem" was a major issue in late 19th century and early 20th century Egyptology, centering on confusion and disagreement on the order of succession of early 18th dynasty pharaohs. The dilemma takes its name from confusion over the chronology of the rule of Queen Hatshepsut and Thutmose I, II, and III. In its day, the problem was controversial enough to cause academic feuds between leading Egyptologists and created perceptions about the early Thutmosid family that persisted well into the 20th century, the influence of which still can be found in more recent works. Chronology-wise, the Hatshepsut problem was largely cleared up in the late 20th century, as more information about her and her reign was uncovered. Sphinx of Hatshepsut with unusual rounded ears and ruff that stress the lioness features of the statue, but with five toes – newel post decorations from the lower ramp of her tomb complex. 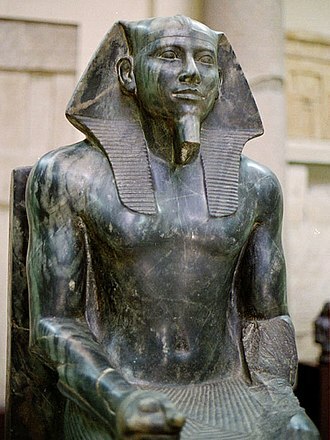 The statue incorporated the nemes headcloth and a royal beard; two defining characteristics of an Egyptian pharaoh. It was placed along with others in Hatshepsut's mortuary temple at Deir el-Bahri. Thurmose III later on destroyed them but was resembled by the Metropolitan Museum of Art. Date: 1479–1458 BC. Period: New Kingdom. 18th Dynasty. Medium: Granite, paint. Dual stela of Hatshepsut (centre left) in the blue Khepresh crown offering wine to the deity Amun and Thutmose III behind her in the hedjet white crown, standing near Wosret – Vatican Museum. Date: 1473–1458 BC. 18th Dynasty. Medium: Limestone. This Relief Fragment Depicting Atum and Hatshepsut was uncovered in Lower Asasif, in the area of Hatshepsut's Valley Temple. It depicts the god Atum, one of Egypt's creator gods, at the left, investing Hatshepsut with royal regalia. Date: 1479–1458 BC. 18th Dynasty. Medium: Painted limestone. A Fallen obelisk of Hatshepsut – Karnak. Life-sized statue of Hatshepsut. 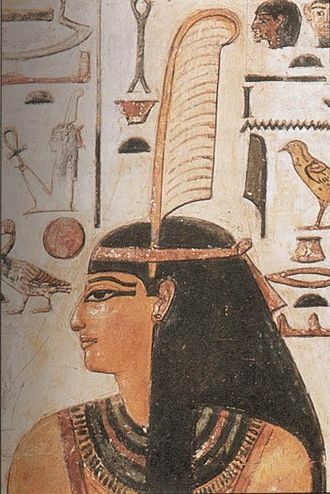 She is shown wearing the nemes-headcloth and shendyt-kilt, which are both traditional for an Egyptian king. The statue is more feminine, given the body structure. Traces of blue pigments showed that the statue was originally painted. Date: 1479–1458 BC. Period: New Kingdom. 18th Dynasty. Medium: Indurated limestone, paint. Location: Deir el-Bahri, Thebes, Egypt. A kneeling statue of Hatshepsut located at the central sanctuary in Deir el-Bahri dedicated to the god Amun-Re. The inscriptions on the statue showed that Hatshepsut is offering Amun-Re Maat, which translates to truth, order or justice. This shows that Hatshepsut is indicating that her reign is based on Maat. Date: 1479–1458 BC. Period: New Kingdom. 18th Dynasty. Medium: Granite. Location: Deir el-Bahri, Thebes, Egypt. 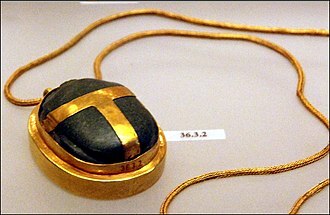 Left – Knot Amulet. Middle – Meskhetyu Instrument. Right – Ovoid Stone. On the knot amulet, Hatshepsut's name throne name, Maatkare, and her expanded name with Amun are inscribed. The Meskhetyu Instrument was used during a funerary ritual, Opening of the Mouth, to revive the deceased. On the Ovoid Stone, hieroglyphics was inscribed on it. The hieroglyphics translate to "The Good Goddess, Maatkare, she made [it] as her monument for her father, Amun-Re, at the stretching of the cord over Djeser-djeseru-Amun, which she did while alive." The stone may have been used as a hammering stone. Farah Ali Abd El Bar portrayed her in the Discovery Channel documentary, Secrets of Egypt's Lost Queen. Sarah Hadland portrayed her in the 2009 TV adaptation of Horrible Histories (written by Terry Deary). A reincarnated Hatshepsut is the subject of the Tina Turner song I Might Have Been Queen. Her Majesty the King. New Holland Publishers (Australia). 2010. ISBN 978-1-921517-08-2. The Horus Throne. New Holland Publishers (Australia). 2010. ISBN 978-1-921517-10-5. The Eye of Re. New Holland Publishers (Australia). 2011. ISBN 978-1-74257-194-2. Marek Halter: Zipporah: Wife of Moses. New York: Crown (1st US Edition). 2005. ISBN 978-1-4000-5279-0. Eloise Jarvis McGraw: Mara: Daughter of the Nile. New York: Puffin. 1985. ISBN 978-0-14-031929-3. Pauline Gedge: Child of the Morning. Macmillan Company of Canada. 1977. ISBN 978-0-7705-1520-1. Her consolidation of power features prominently in the Amerotke series of murder mysteries by Paul Doherty, in which the fictional detective is a judge in Hatshepsut's service. She is referred to as Hatusu, a shortening of her name, throughout the novels. The first novel in the series, The Mask of Ra, focuses on the death of her husband-brother and her seizure of power. The artwork for The Dinner Party features a place setting for Hatshepsut. Djehuty, overseer of the treasuries under Hatshepsut's rule. ^ a b c d e "Queen Hatshepsut". Phouka. Retrieved April 13, 2008. ^ a b c Tyldesley, Hatchepsut, p. 226. ^ a b c d Wilford, John Noble (June 27, 2007). "Tooth May Have Solved Mummy Mystery". New York Times. Retrieved June 29, 2007. A single tooth and some DNA clues appear to have solved the mystery of the lost mummy of Hatshepsut, one of the great queens of ancient Egypt, who reigned in the 15th century B.C. ^ "Hatshepsut". Dictionary.com. Retrieved July 27, 2007. ^ Clayton, Peter (1994). Chronicle of the Pharaohs. Thames & Hudson. p. 104. ^ Wilkinson, Toby (2010). The Rise and Fall of Ancient Egypt. London: Bloomsbury. pp. 181, 230. ISBN 978-1-4088-1002-6. ^ Kara., Cooney (2015). Woman Who Would be King. Oneworld Publications. ISBN 978-1-322-38466-5. OCLC 897502797. ^ "Queen Hatshepsut (1500 B.C.)". nbufront.org. ^ Martin, G. (2012-12-23). African Political Thought. Springer. ISBN 978-1-137-06205-5. ^ Roehig, Catherine; Dreyfus, Renee; Keller, Cathleen (2015). Hatshepsut: from Queen to Pharaoh. New York: Metropolitan Museum of Art. ^ Dodson, Aidan; Dyan, Hilton (2004). The Complete Royal Families of Ancient Egypt. Thames & Hudson. p. 130. ISBN 978-0-500-05128-3. ^ Fletcher, Joann (2013). The Search For Nefertiti. Hachette UK. p. 156. ISBN 978-1-4447-8054-3. ^ Stiebing Jr., William H. (2016). Ancient Near Eastern History and Culture. Routledge. p. 177. ISBN 978-1-315-51116-0. 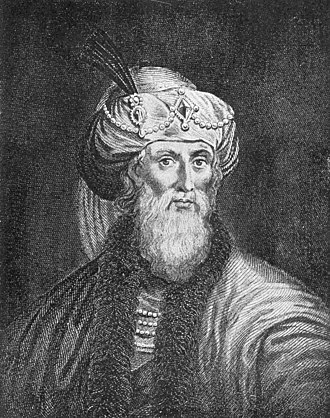 ^ Josephus. Against Apion. 1.1.15. , Perseus Project Ap.1.15, . ^ Steindorff, George; Seele, Keith (1942). When Egypt Ruled the East. University of Chicago. p. 53. ^ a b Grimal, Nicolas (1988). A History of Ancient Egypt. Librairie Arthéme Fayard. p. 204. ^ Gabolde, Luc (1987), La Chronologie du règne de Tuthmosis II, ses conséquences sur la datation des momies royales et leurs répercutions sur l'histoire du développement de la Vallée des Rois, SAK 14: pp. 61–87. ^ Tyldesley, Joyce (1996). Hatchepsut: The Female Pharaoh (hardback ed.). Penguin Books. p. 99. ISBN 978-0-14-024464-9. ^ a b Tyldesley, Hatchepsut, p. 99. ^ Njoku, Raphael Chijioke (2013). 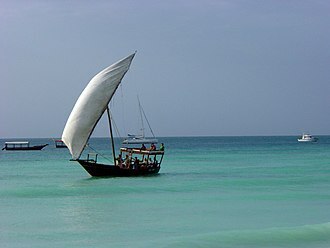 The History of Somalia. ABC-CLIO. pp. 29–31. ISBN 978-0-313-37857-7. ^ Isaac, Michael (2004). A Historical Atlas of Oman. The Rosen Publishing Group. p. 14. ISBN 978-0-8239-4500-9. Retrieved September 5, 2014. ^ a b Joyce Tyldesley, Hatchepsut: The Female Pharaoh, Penguin Books, 1998 paperback, pp. 137–144. ^ Ruffer, Marc Armand (1921). Studies in the Palaeopathology of Egypt. University of Chicago Press. p. 45. Retrieved September 5, 2014. ^ Margaret Bunson, Encyclopedia of Ancient Egypt, p. 161. ^ JJ Shirley: The Power of the Elite: The Officials of Hatshepsut's Regency and Coregency, in: J. Galán, B.M. Bryan, P.F. Dorman (eds. ): Creativity and Innovation in the Reign of Hatshepsut, Studies in Ancient Oriental Civilization 69, Chicago 2014, ISBN 978-1-61491-024-4, p. 206. ^ Peter Tyson, The Unfinished Obelisk, NOVA online adventure, March 16, 1999. ^ James P. Allen, "The Speos Artemidos Inscription of Hatshepsut" Archived 2007-04-03 at the Wayback Machine, Bulletin of the Egyptological Seminar 16 (2002), pp. 1–17, pls.1+2. ^ Gray, Martin. "Obelisk of Queen Hapshetsut, Karnak". Places of Peace and Power. Retrieved 9 November 2017. ^ Christensen, Martin, K. I. (July 27, 2007). "Women in Power: BC 4500-1000". Worldwide Guide to Women in Leadership. Retrieved August 25, 2007. ^ Shaw and Nicholson, p. 28. ^ John Ray, Reflections of Osiris: Lives from Ancient Egypt (New York: Oxford University Press, 2002), 47. ^ a b "Hatshepsut". pbs.org. ^ Nevine El-Aref, "Back in the limelight", Al-Ahram Weekly. ^ Breasted, James Henry, Ancient Records of Egypt: Historical Documents from the Earliest Times to the Persian Conquest, The University of Chicago Press, 1906, pp. 116–117. ^ Hatshepsut, Female Pharaoh of Egypt by Caroline Seawright. ^ Will Cuppy, The Decline and Fall of Practically Everybody, New York: Barnes & Noble Books, reprint 1992. ^ Joyce Tyldesley, Chronicle of the Queens of Egypt, Thames & Hudson, 2006, p. 106. ^ Jürgen von Beckerath, Chronologie des Pharaonischen Ägypten. Mainz, Philipp von Zabern. 1997, p. 189. ^ "The Search for Hatshepsut and the Discovery of Her Mummy – Dr. Zahi Hawass – The Plateau". guardians.net. Retrieved 2018-11-26. ^ "Tooth Clinches Identification of Egyptian Queen". Reuters. June 27, 2007. Retrieved April 13, 2008. ^ Dennis C. Forbes, Maatkare Hatshepset: The Female Pharaoh, KMT, Fall 2005, pp. 26–42. ^ Bickerstaffe, Dylan, "The Discovery of Hatshepsut's 'Throne'", KMT, Spring 2002, pp. 71–77. ^ "Photo Gallery: Mummy of Egypt's Lost Queen Found". nationalgeographic.com. ^ Ed Pilkington and Mark Tran (June 27, 2007). "Tooth solves Hatshepsut mummy mystery". The Guardian. ^ Jennie Cohen, "Did Skin Cream Kill Egypt’s Queen Hatshepsut? ", History, August 19, 2011. ^ Gardiner, Alan, Egypt of the Pharaohs, Oxford University Press, 1964, p. 198. ^ Tyldesley, Hatchepsut, p. 206. ^ Tyldesley, Hatchepsut, p. 207, Tyldesley notes on p. 252 that a detailed discussion of Senenmut's disappearance and a useful list of other publications on this topic is given in A. R. Schulman's 1969–70 paper "Some Remarks on the Alleged 'Fall' of Senmut," JARCE 8, pp. 29–48. ^ Tyldesley, Hatchepsut, p. 225. ^ Tyldesley, Hatchepsut, pp. 225–226. ^ Bediz, David. "The Story of Hatshepsut". Archived from the original on June 29, 2007. Retrieved June 27, 2007. ^ Mensan, Romain (Spring 2007). "Tuthmosid foundation deposits at Karnak". Egyptian Archaeology. 30: 21. ^ "Sphinx of Hatshepsut". metmuseum.org. Retrieved 2018-11-26. ^ "Stele of Hatshepsut and Thutmose III – Vatican Museums". Retrieved 2018-12-03. ^ "Relief Fragment Depicting Atum and Hatshepsut". metmuseum.org. Retrieved 2018-12-03. ^ "Seated Statue of Hatshepsut". metmuseum.org. Retrieved 2018-11-26. ^ "Large Kneeling Statue of Hatshepsut". metmuseum.org. Retrieved 2018-11-26. ^ Roehrig, Catharine (2005). Hatshepsut: From Queen to Pharaoh. The Metropolitan Museum of Art. p. 145. ^ Place Settings. Brooklyn Museum. Retrieved on August 6, 2015. Brown, Chip (April 2009). "The King Herself". National Geographic: 88–111. Fairman, H. W.; B. Grdseloff (1947). "Texts of Hatshepsut and Sethos I inside Speos Artemidos". Journal of Egyptian Archaeology. 33: 12–33. doi:10.2307/3855434. JSTOR 3855434. Fakhry, Ahmed (1939). "A new speos from the reign of Hatshepsut and Thutmosis III at Beni-Hasan". Annales du Service des Antiquités de l'Égypte. 39: 709–723. Gardiner, Alan Henderson (1946). "Davies's copy of the great Speos Artemidos inscription". Journal of Egyptian Archaeology. 32: 43–56. doi:10.2307/3855414. JSTOR 3855414. Harbin, Michael A. (2005). The Promise and the Blessing: A Historical Survey of the Old and New Testaments. Grand Rapids, MI: Zondervan. ISBN 978-0-310-24037-2. Nadig, Peter (2014). Hatschepsut. Mainz: von Zabern. ISBN 978-3-8053-4763-1. Redford, Donald B. (1967). History and Chronology of the 18th dynasty of Egypt: Seven studies. Toronto: University of Toronto Press. Shaw, Ian, ed. (2002). The Oxford History of Ancient Egypt. Oxford: Oxford University Press. ISBN 978-0-19-280293-4. Tyldesley, Joyce (1996). Hatchepsut: The Female Pharaoh. London: Viking. ISBN 978-0-670-85976-4. Wells, Evelyn (1969). Hatshepsut. Garden City, NY: Doubleday. Aldred, Cyril (1952). The Development of Ancient Egyptian Art from 3200 to 1315 BC. London: A. Tiranti. Edgerton, William F. (1933). The Thutmosid Succession. Chicago: University of Chicago Press. Gardiner, Sir Alan (1961). Egypt of the Pharaohs. Oxford: Clarendon Press. Hayes, William C. (1973). "Egypt: Internal Affairs from Thuthmosis I to the Death of Amenophis III". Cambridge Ancient History: History of the Middle East and the Aegean Region, c. 1800–1380 BC (3rd ed.). London: Cambridge University Press. Maspero, Gaston (1903–1906). History of Egypt, Chaldea, Syria, Babylonia, and Assyria. London: Grolier Society. Nims, Charles F. (1965). Thebes of the Pharaohs: Pattern for Every City. New York: Stein and Day. Roehrig, Catharine H.; Dreyfus, Renée; Keller, Cathleen A., eds. (2005). Hatshepsut: From Queen to Pharaoh. New York: The Metropolitan Museum of Art. ISBN 978-1-58839-172-8. Wilson, John A. (1951). The Burden of Egypt. Chicago: University of Chicago Press. The word pharaoh ultimately derive from the Egyptian compound pr-ˤ3 great house, written with the two biliteral hieroglyphs pr house and ˤ3 column, here meaning great or high. It was used only in larger phrases such as smr pr-ˤ3 Courtier of the High House, with specific reference to the buildings of the court or palace. From the twelfth dynasty onward, the word appears in a wish formula Great House, may it live, and be in health, but again only with reference to the royal palace and not the person. During the reign of Thutmose III in the New Kingdom, after the rule of the Hyksos during the Second Intermediate Period. During the eighteenth dynasty the title pharaoh was employed as a designation of the ruler. From the nineteenth dynasty onward pr-ˤ3 on its own was used as regularly as hm. f, the term, evolved from a word specifically referring to a building to a respectful designation for the ruler, particularly by the twenty-second dynasty and twenty-third dynasty. 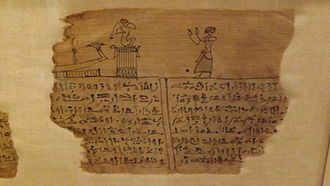 For instance, the first dated appearance of the pharaoh being attached to a rulers name occurs in Year 17 of Siamun on a fragment from the Karnak Priestly Annals. Here, an induction of an individual to the Amun priesthood is dated specifically to the reign of Pharaoh Siamun and this new practice was continued under his successor Psusennes II and the twenty-second dynasty kings. Shoshenq I was the successor of Siamun. Meanwhile, the old custom of referring to the sovereign simply as pr-ˤ3 continued in traditional Egyptian narratives, by this time, the Late Egyptian word is reconstructed to have been pronounced *par-ʕoʔ whence Herodotus derived the name of one of the Egyptian kings, Φερων. In the Bible, the title occurs as פרעה, from that, Septuagint φαραώ pharaō and Late Latin pharaō, both -n stem nouns. The Quran likewise spells it فرعون firawn with n, the Arabic combines the original pharyngeal ayin sound from Egyptian, along with the -n ending from Greek. English at first spelt it Pharao, but the King James Bible revived Pharaoh with h from the Hebrew, meanwhile in Egypt itself, *par-ʕoʔ evolved into Sahidic Coptic ⲡⲣ̅ⲣⲟ prro and rro. Scepters and staves were a sign of authority in ancient Egypt. An empress regnant is a female monarch who reigns in her own right over an empire. A queen regnant possesses and exercises sovereign powers, a queen consort shares her husbands rank and titles, but does not share the sovereignty of her husband. The husband of a queen regnant traditionally does not share his wifes rank, the concept of a king consort is not unheard of in contemporary or classical periods. A queen dowager is the widow of a king, a queen mother is a queen dowager who is the mother of a reigning sovereign. The Byzantine Empress Irene sometimes called herself basileus, rather than basilissa and Jadwiga of Poland was crowned as Rex Poloniae, King of Poland. Among the Davidic Monarchs of the Kingdom of Judah, there is mentioned a queen regnant, Athaliah. The much Hasmonean Queen Salome Alexandra was highly popular, accession of a regnant occurs as a nations order of succession permits. The scope of succession may be matrilineal, patrilineal, or both, or, open to general election when necessary, the right of succession may be open to men and women, or limited to men only or women only. Historically, many realms forbade succession by women or through a line in obedience to the Salic law. No queen regnant ever ruled France, for example, only one woman, Maria Theresa, ruled Austria. As noted in the list below of widely known ruling queens, in the waning days of the 20th century and early days of the 21st, Norway, the Netherlands, Denmark and the UK amended their acts of succession to absolute primogeniture. In some cases the change does not take effect during the lifetimes of people already in the line of succession at the time the law was passed, in 2011, the 16 Realms of the Commonwealth agreed to remove the rule of male-preference primogeniture. Once the necessary legislation was passed, this means that had Prince William had a daughter first, in China, Wu Zetian became the Chinese empress regnant and established the Zhou Dynasty after dismissing her sons. It should be noted, that Empress Wu used the title huangdi and in many European sources, although the Chrysanthemum Throne of Japan is currently barred to women, this has not always been the case, throughout Japanese history there have been eight empresses regnant. A queen consort is the wife of a reigning king. In Brunei, the wife of the Sultan is known as a Raja Isteri with prefix Pengiran Anak, equivalent with queen consort in English, a queen consort usually shares her husbands social rank and status. She holds the equivalent of the kings monarchical titles, but historically, she does not share the kings political. A queen regnant is a queen in her own right with all the powers of a monarch, where some title other than that of king is held by the sovereign, his wife is referred to by the feminine equivalent, such as princess consort or empress consort. In monarchies where polygamy has been practiced in the past, or is practiced today. In Morocco, King Mohammed VI has broken with tradition and given his wife, Lalla Salma, prior to the reign of King Mohammed VI, the Moroccan monarchy had no such title. In Thailand, the king and queen must both be of royal descent, the kings other consorts are accorded royal titles that confer status. 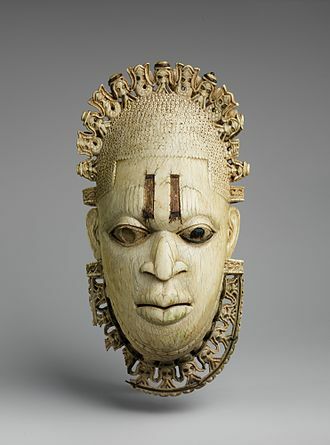 Other cultures maintain different traditions on queenly status, a Zulu chieftain designates one of his wives Great Wife, which would be the equivalent to queen consort. Maat or Maat was the ancient Egyptian concept of truth, order, law and justice. 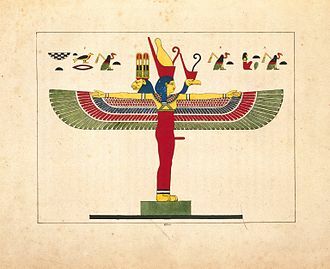 Maat was personified as a goddess regulating the stars, cuneiform texts indicate that the word mˤ3t was pronounced /múʕʔa/ during the New Kingdom period, having lost the feminine ending t. Sound shifts from u to e produced the cognate Coptic word ⲙⲉⲉ/ⲙⲉ truth, later, as a goddess in other traditions of the Egyptian pantheon, where most goddesses were paired with a male aspect, her masculine counterpart was Thoth, as their attributes are similar. In other accounts, Thoth was paired off with Seshat, goddess of writing and measure and her feather was the measure that determined whether the souls of the departed would reach the paradise of afterlife successfully. Pharaohs are often depicted with the emblems of Maat to emphasise their role in upholding the laws of the Creator, Maat represents the ethical and moral principle that every Egyptian citizen was expected to follow throughout their daily lives. They were expected to act with honor and truth in manners that involve family, the community, the nation, the environment, Maat as a principle was formed to meet the complex needs of the emergent Egyptian state that embraced diverse peoples with conflicting interests. The development of such rules sought to avert chaos and it became the basis of Egyptian law, from an early period the King would describe himself as the Lord of Maat who decreed with his mouth the Maat he conceived in his heart. The ancient Egyptians had a conviction of an underlying holiness. Cosmic harmony was achieved by public and ritual life. Any disturbance in cosmic harmony could have consequences for the individual as well as the state, an impious King could bring about famine or blasphemy blindness to an individual. In opposition to the order expressed in the concept of Maat is the concept of Isfet, lies. In one Middle Kingdom text the Creator declares I made every man like his fellow, a passage in the Instruction of Ptahhotep presents Maat as follows, Maat is good and its worth is lasting. It has not been disturbed since the day of its creator and it lies as a path in front even of him who knows nothing. Wrongdoing has never yet brought its venture to port and it is true that evil may gain wealth but the strength of truth is that it lasts, a man can say, It was the property of my father. Thutmose II was the fourth Pharaoh of the Eighteenth dynasty of Egypt. He built some minor monuments and initiated at least two minor campaigns but did little else during his rule and was strongly influenced by his wife. His reign is dated from 1493 to 1479 BC. Thutmose IIs body was found in the Deir el-Bahri Cache above the Mortuary Temple of Hatshepsut, Thutmose II was the son of Thutmose I and a minor wife, Mutnofret. He was, therefore, a son of Thutmose I and chose to marry his fully royal half-sister, Hatshepsut. This is often interpreted as evidence that Thutmose II was still a minor at his accession, Thutmose II fathered Neferure with Hatshepsut, but managed to father a male heir, the famous Thutmose III, by a lesser wife named Iset before his death. She is depicted in several raised relief scenes from a Karnak gateway dating to Thutmose IIs reign both together with her husband and alone, manethos Epitome refers to Thutmose II as Chebron and gives him a reign of 13 years, but this figure is highly disputed among scholars. Some Egyptologists prefer to shorten his reign by a decade to only 3 years because his highest Year Date is only a Year 1 II Akhet day 8 stela. Nonetheless, scholars generally assign him a reign from 1493 or 1492 to 1479, who was already aged by the start of Thutmose IIs reign, lived through this rulers entire reign into that of Hatshepsut. In addition, Thutmose II is poorly attested in the monumental record, even this monument was not completed in Thutmose IIs reign but in the reign of his son Thutmose III, which hints at the nearly ephemeral nature of Thutmose IIs reign. The gateway was dismantled and its building blocks incorporated into the foundation of the Third Pylon by Amenhotep III, in 1987, Luc Gabolde published an important study that statistically compared the number of surviving scarabs found under Thutmose I, Thutmose II and Hatshepsut. Hatshepsuts reign is believed to have lasted for 21 years and 9 months, unless there was an abnormally low number of scarabs produced under Thutmose II, this would indicate that the kings reign was rather short-lived. The royal titulary or royal protocol of an Egyptian pharaoh is the standard naming convention taken by the kings of Ancient Egypt. It symbolises worldly power and holy might and acts as a sort of mission statement for the reign of a monarch. The full titulary, consisting of five names, did not come into standard usage until the Middle Kingdom, the Horus name is the oldest form of the pharaohs name, originating in the Predynastic Period. Many of the oldest-known Egyptian pharaohs were known only by this title, the Horus name was usually written in a serekh, a representation of a palace façade. The name of the pharaoh was written in hieroglyphs inside this representation of a palace, typically an image of the falcon God Horus was perched on top of or beside it. At least one Egyptian ruler, the 2nd dynasty Seth-Peribsen, used an image of the god Seth instead of Horus and he was succeeded by Khasekhemwy, who placed the symbols of both Seth and Horus above his name. Thereafter, the image of Horus always appeared alongside the name of the pharaoh, by the time of the New Kingdom the Horus name was often written without the enclosing serekh. The name is first definitively used by the First Dynasty pharaoh Semerkhet and this particular name was not typically framed by a cartouche or serekh, but always begins with the hieroglyphs of a vulture and cobra resting upon two baskets, the dual noun nebty. Also known as the Golden Horus Name, this form of the name typically featured the image of a Horus falcon perched above or beside the hieroglyph for gold. The meaning of this title has been disputed. One belief is that it represents the triumph of Horus over his uncle Seth, Gold was strongly associated in the ancient Egyptian mind with eternity, so this may have been intended to convey the pharaohs eternal Horus name. Similar to the Nebty name, this particular name typically was not framed by a cartouche or serekh, the pharaohs throne name, the first of the two names written inside a cartouche, and usually accompanied the title nsw-bity. The term nsw-bity It has been suggested that the Berber term for strong man, the epithet neb tawy, Lord of the Two Lands, referring to valley and delta regions of Egypt, often occurs as well. James Henry Breasted was an American archaeologist and historian. After completing his PhD at the University of Berlin in 1894, in 1901 he became director of the Haskell Oriental Museum at the university, where he continued to concentrate on Egypt. In 1905 Breasted was promoted to professor, and was the first chair in Egyptology, in 1919 he became the founder of the Oriental Institute at the University of Chicago, a center for interdisciplinary study of ancient civilizations. Breasted was a field researcher, and had a productive interest in recording and interpreting ancient writings. James Henry Breasted was born on Aug.27,1865 and he was educated at North Central College, graduated in 1888, and attended Chicago Theological Seminary but transferred to Yale University to study Hebrew. He received a degree from Yale in 1891 and, on the advice of William Rainey Harper, went to University of Berlin. Erman had just established a new school of Egyptology, concentrating systematically on grammar, Breasted received his doctorate in 1894. He was the first American citizen to obtain a PhD in Egyptology, in 1894 Breasted married Frances Hart. Hart and her sisters were in Germany at the time as Breasted, learning the German language. It was a vacation as Breasted had been recruited to build a collection of Egyptian antiquities for the University of Chicago. Hart died four decades in 1934, after which Breasted married one of her sisters, Breasted popularized the term Fertile Crescent to describe the archaeologically important area including parts of present-day Iraq, Turkey, Jordan and Israel. Breasted became an instructor at the University of Chicago in 1894 soon after earning his doctorate, five years the university agreed to his accepting an invitation from the Prussian Academy of Sciences to work on its Egyptian dictionary project. From 1899 to 1908 he did work in Egypt, which established his reputation. He began to publish articles and monographs, as well as his History of Egypt from the Earliest Times Down to the Persian Conquest in 1905. The Land of Punt, called Pwenet, or Pwene by the ancient Egyptians, was an ancient kingdom. A trading partner of Egypt, it was known for producing and exporting gold, aromatic resins, ebony, the region is known from ancient Egyptian records of trade expeditions to it. Some biblical scholars have identified it with the land of Put. 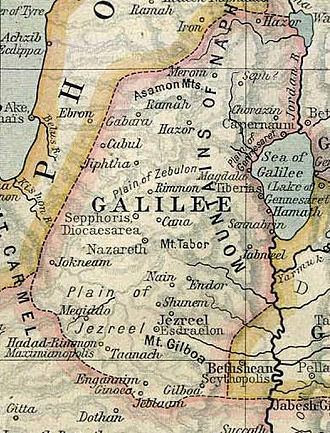 At times Punt is referred to as Ta netjer, the Land of the God, the exact location of Punt is still debated by historians. Most scholars today believe Punt was situated to the southeast of Egypt, most likely in the region of modern Djibouti, northeast Ethiopia, Somalia. However, some scholars point instead to a range of ancient inscriptions that locate Punt in the Arabian Peninsula and it is possible that the territory covered both the Horn of Africa and Southern Arabia. Puntland, the Somali administrative region situated at the extremity of the Horn of Africa, is named in reference to the Land of Punt, the earliest recorded ancient Egyptian expedition to Punt was organized by Pharaoh Sahure of the Fifth Dynasty. However, gold from Punt is recorded as having been in Egypt as early as the time of Pharaoh Khufu of the Fourth Dynasty, there were more expeditions to Punt in the Sixth, Eleventh and Eighteenth dynasties of Egypt. In the Twelfth Dynasty, trade with Punt was celebrated in literature in the Tale of the Shipwrecked Sailor. In the reign of Mentuhotep III, an officer named Hannu organized one or more voyages to Punt, trading missions of the 12th dynasty pharaohs Senusret I, Amenemhat II and Amenemhat IV had successfully navigated their way to and from the mysterious land of Punt. Hatshepsut personally made the most famous ancient Egyptian expedition that sailed to Punt, a report of that five-ship voyage survives on reliefs in Hatshepsuts mortuary temple at Deir el-Bahri. In reality, Nehsis expedition was a trading mission to a land, Punt. Moreover, Nehsis visit to Punt was not inordinately brave since he was accompanied by at least five shiploads of marines and greeted warmly by the chief of Punt and his immediate family. The Hyksos were a people of mixed origins from Western Asia, who settled in the eastern Nile Delta, some time before 1650 BC. The arrival of the Hyksos led to the end of the Thirteenth Dynasty of Egypt, in the context of Ancient Egypt, the term Asiatic – which is often used of the Hyksos – may refer to any people native to areas east of Egypt. Immigration by Canaanite populations preceded the Hyksos, canaanites first appeared in Egypt towards the end of the 12th Dynasty c.1800 BC, and either around that time or c.1720 BC, established an independent realm in the eastern Nile Delta. 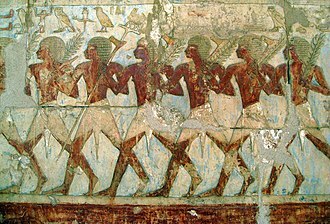 The Canaanite rulers of the Delta, regrouped in the Fourteenth Dynasty, coexisted with the Egyptian Thirteenth Dynasty, the power of the 13th and 14th Dynasties progressively waned, perhaps due to famine and plague. In about 1650 BC, both dynasties were invaded by the Hyksos, who formed the Fifteenth Dynasty. The collapse of the Thirteenth Dynasty created a vacuum in the south, which may have led to the rise of the Sixteenth Dynasty, based in Thebes. The Hyksos eventually conquered both, albeit for only a time in the case of Thebes. From on, the 17th Dynasty took control of Thebes and reigned for some time in peaceful coexistence with the Hyksos kings, Seqenenre Tao and Ahmose waged war against the Hyksos and expelled Khamudi, their last king, from Egypt c.1550 BC. The Hyksos practiced horse burials, and their deity, their native storm god, became associated with the Egyptian storm and desert god. The Hyksos were a people of mixed Asiatic origin with mainly Semitic-speaking components, although some scholars have suggested that the Hyksos contained a Hurrian component, most other scholars have dismissed this possibility. 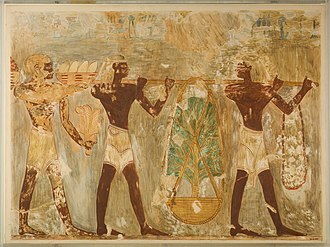 The Hyksos brought several innovations to Egypt, as well as cultural infusions such as new musical instruments. The changes introduced include new techniques of working and pottery, new breeds of animals. In warfare, they introduced the horse and chariot, the bow, improved battle axes. Because of these advances, Hyksos rule became decisive for Egypt’s empire in the Middle East. Ra or Re is the ancient Egyptian sun god. By the Fifth Dynasty in the 25th and 24th centuries BC, he had become a god in ancient Egyptian religion. In Egyptian dynastic times, Ra was merged with the god Horus and he was believed to rule in all parts of the created world, the sky, the earth, and the underworld. He was associated with the falcon or hawk, when in the New Kingdom the god Amun rose to prominence he was fused with Ra as Amun-Ra. 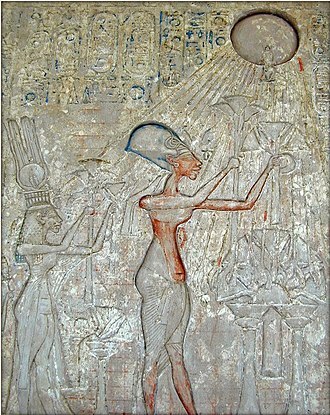 During the Amarna Period, Akhenaten suppressed the cult of Ra in favor of another deity, the Aten, the deified solar disc. The cult of the Mnevis bull, an embodiment of Ra, had its center in Heliopolis, all forms of life were believed to have been created by Ra, who called each of them into existence by speaking their secret names. Alternatively man was created from Ras tears and sweat, hence the Egyptians call themselves the Cattle of Ra, in the myth of the Celestial Cow it is recounted how mankind plotted against Ra and how he sent his eye as the goddess Sekhmet to punish them. When she became bloodthirsty she was pacified by drinking beer mixed with red dye, to the Egyptians, the sun represented light and growth. This made the sun deity very important, as the sun was seen as the ruler of all that he created, the sun disk was either seen as the body or eye of Ra. Ra was the father of Shu and Tefnut, whom he created, Shu was the god of the wind, and Tefnut was the goddess of the rain. Sekhmet was the Eye of Ra and was created by the fire in Ras eye, Ra was thought to travel on the Atet, two solar barks called the Mandjet or morning boat and the Mesektet or evening boat. These boats took him on his journey through the sky and the Duat, while Ra was on the Mesektet, he was in his ram-headed form. When Ra traveled in his sun boat, he was accompanied by other deities including Sia and Hu. Sometimes, members of the Ennead helped him on his journey, including Set, who overcame the serpent Apophis, and Mehen, when Ra was in the underworld, he would visit all of his various forms. Akhenaten and his family adoring the Aten. Second from the left is Meritaten, daughter of Akhenaten. Ostrakon with the beginning of the Ghost story. Terracotta from Deir el-Medina, 19th–20th Dynasties, New Kingdom of Egypt. Found by Ernesto Schiaparelli in 1905. Museo Egizio, S.6619. A fragmentary statue of Ahmose I, Metropolitan Museum of Art. Copper axe blade inscribed with the titulary of pharaoh Ahmose I, Ashmolean Museum. 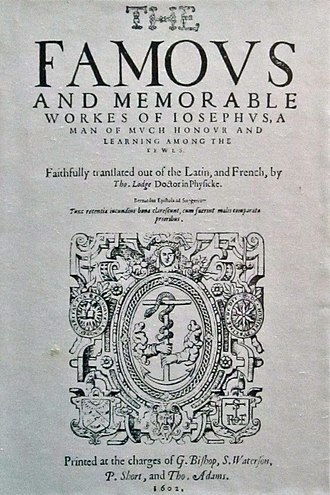 The works of Josephus translated by Thomas Lodge (1602). 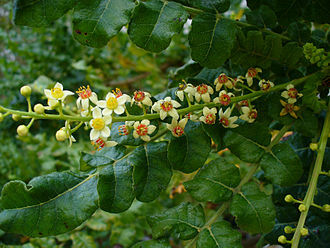 Flowers and branches of the Boswellia sacra tree, the species from which people produce most frankincense. Relief of Thutmose II in Karnak Temple complex. Aakheperenre, the praenomen of Thutmose II, temple of Hatshepsut, Luxor. A group of people labelled Asiatics (the glyphs immediately above the head of the first animal) entering Egypt c.1900 BC. From the tomb of 12th-dynasty official Khnumhotep II, at Beni Hasan. Mummified head of Seqenenre Tao, bearing axe wounds. The common theory is that he died in a battle against the Hyksos. Thutmose III and his family from his tomb KV34. On the boat: Menkheperre Thutmose III and his mother Iset.